Michael, 50, is a father and husband, living with adrenoleukodystrophy (ALD). Michael speaks about his experiences and how he has been encouraging his family to have genetic testing. It wasn’t until a few years later that Michael received the correct diagnosis. “I started seeing a consultant neurologist and had several MRI scans of my head and neck. I also had lumbar punctures, nerve conduction tests, blood tests and more. My doctor told me on Christmas Eve 2015 that I had multiple sclerosis. I can understand why, as a lot of the symptoms look similar, but neither of us were completely convinced by that diagnosis, so he continued performing tests until May 2016. That’s when he finally diagnosed me with adrenoleukodystrophy. Since 2010, Michael’s symptoms have progressed and he now finds it harder to walk without falling. “I’m still able to live a fairly normal life but I have started to fall more recently. For example, the other day someone else had parked in the disabled space at work, which meant I had to walk a bit further across the car park. I got half way across and I just fell over – even just over that short distance. Having ALD has made me nervous about going anywhere alone. I am extremely forgetful and have to keep checking myself, checking that I’ve got money with me and things like that. I worry about losing my car key and I am always checking my bag is in a safe place. I am always tired as well. Michael’s family has been affected by neurological conditions in the past. His father had motor neurone disease (MND), a condition which causes muscle wasting and nerve degeneration. “It was December 2000 when my father was told he had motor neurone disease. None of us knew anything about it and it came as a big shock. Over Christmas that year, he got progressively worse and quite quickly. He soon could no longer walk up and down stairs at all and my parents had to move into a flat. In February 2002, he passed away. My kids were quite small at the time so I had to spend a lot of time looking after them, and I was also working a lot of the time. That meant that I didn’t really see my dad as much as I would have wanted to, before he died. But when I did go, I could see that he was declining quite rapidly. He died on a Monday, and myself and the kids were there on the Friday night before, which was nice. It made me feel like it was all meant to happen that way. Michael’s Uncle Arthur had Addison’s disease, a rare disorder of the adrenal glands, which stops them from producing enough of certain hormones. Many people with ALD develop Addison’s disease. Michael has been to see a genetic specialist to learn more about how the rest of his family could be affected. “The genetic specialist asked my permission to contact my mother and my daughter, so that they could come and get tested. My mother received testing and we found out that she is a carrier of ALD. She hasn’t experienced any of the symptoms that women can have, so hopefully that means she won’t develop any now. Michael has two children, Rachael and Matthew. As ALD is X-linked, it cannot be passed on from a father to son, however his daughter Rachel is a likely carrier of the ALD gene. Michael has been keen to find out more information ever since his diagnosis and approached patient groups to find out more. “It may sound weird, but when you’ve actually got a condition, sometimes the last thing you want to do is read about it. It’s very real for you, you are living it. Sometimes it can feel like it’s just reminding you of what you’ve got and what’s going to happen to you. But I know I can’t ignore it and I read because I know it’s important. It’s also helpful to read the stories of other people with ALD because they are the only ones who understand you. I feel it’s therapeutic to share and talk about your experiences. I even spoke to MND Scotland about my father this year as it was the 15th anniversary of his death. 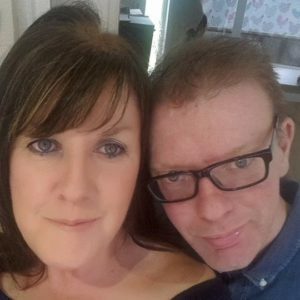 My wife, Carol Ann, has been suffering with breast cancer and has had a suspected stroke, so both being unwell at the same time brings challenges. But whenever one is down the other one tries to help. We are going through it together. You just have to try to keep positive. With this disease you need to learn to slow down and take things easy. It takes longer to check and recheck than it does to do it more slowly in the first place.